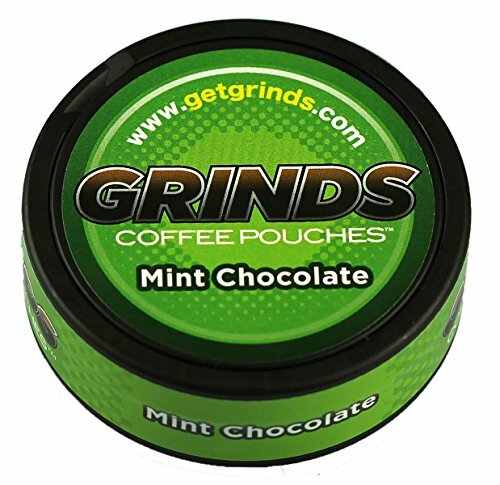 Grinds Coffee Pouches are the original coffee chew, a tobacco free and nicotine free coffee pouch used by many to stop chewing tobacco. Each pouch contains caffeine equal to 1/4 cup of coffee, as well as some guarana, taurine and B-vitamins for energy. Each can contains approximately 16 pouches, and we sell the cans in various quantities, starting with a minimum of 3 cans. Grinds is found in clubhouses across MLB, NFL and NHL, in police and fire stations, in ambulances, on hunting trips, on oil rigs, and much much more. We currently have 7 different flavors of Grinds Coffee Pouches available for sale, and we are adding new flavors every year (as well as always working to make the best pouch and experience we can). Mint Chocolate tastes like an Andes Mint or a Thin Mint Girl Scout Cookie, and is recommended for mint tobacco users, and really everyone! Caramel tastes like a light caramel latte with a hint of sweetness, and is recommended for coffee lovers and caramel coffee drinkers. Cinnamon Roll tastes like a bite of a cinnamon roll and a swig of coffee, and is recommended for Cinnabon fans, tobacco users who want to feel a burn/tingle. Mocha is our original flavor, tastes like a bold coffee flavor with notes of chocolate, and is recommended for coffee lovers, new customers, and people with traditional taste. Peppermint tastes like a strong peppermint latte without the sweetness, and is recommended for peppermint fans, mint tobacco users, and people who want coffee while maintaining fresh breath. Vanilla tastes like a light vanilla latte with just a hint of sweetness, and is recommended for coffee lovers, vanilla tobacco users, and new Grinds users. Black Coffee tastes like a nice, bold, black cup of coffee, and is recommended for coffee lovers and black coffee drinkers.  STOP CHEWING TOBACCO & START USING GRINDS: A caffeine kick to help you Grind it out! If you have any questions about this product by Grinds Coffee Pouches, contact us by completing and submitting the form below. If you are looking for a specif part number, please include it with your message.